Prominent Egyptian Blogger Arrested : The Two-Way Alaa Abdel-Fattah rose to fame during the 2011 uprising that ousted President Hosni Mubarak. Police arrested him late Thursday under a controversial new law that bans unauthorized protests. 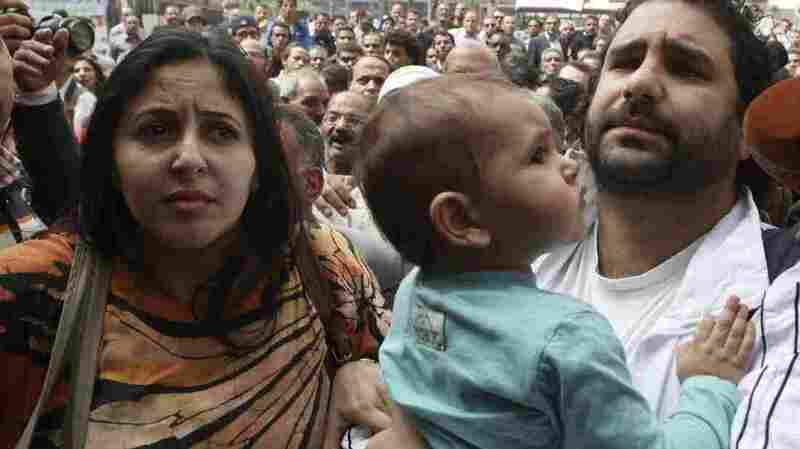 Alaa Abdel-Fattah, seen with his wife and child in March, was arrested from his home Thursday. An Egyptian blogger who rose to fame during the 2011 uprising that ousted President Hosni Mubarak has been arrested under a controversial new law that bans unauthorized protests. "Abdel-Fattah previously was detained for two months in late 2011 by military authorities over allegations he attacked soldiers carrying out a bloody crackdown on protesters. He was later released without charge. He also was accused of inciting violence during clashes between opponents and supporters of Morsi before his ouster." He was previously arrested in 2006 and spent a month and a half in jail. NPR's Michele Norris spoke to Abdel-Fattah in June 2011, after mass protests ousted longtime leader Mubarak. At the time, he described himself as "a foot soldier" in the uprising.